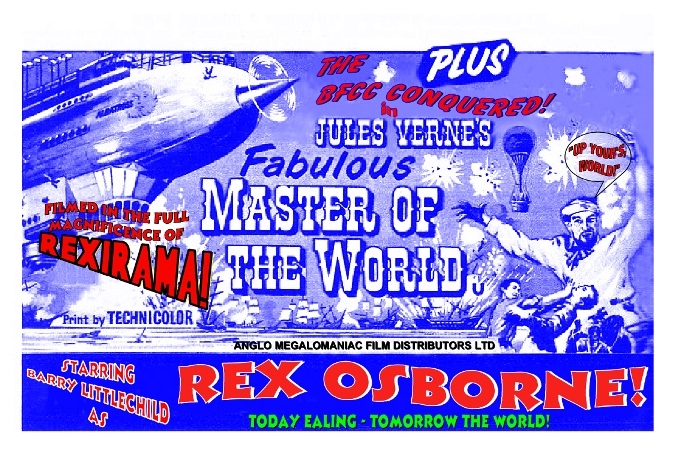 Q: WHY ARE ALL CINEMA EXITS TO BE RENAMED "REX OSBOURNE'S? A: BECAUSE THEY'RE ON THEIR WAY OUT! BFCC.BIZ EXCLUSIVE! : When 'ACE magazine' folded there was a great sense of loss for this excellent journal. Not quite the same loss was felt by some when 'Silver Screen Magazine' ceased: several collectors and organisations had at one time or other been maligned by one of it’s contributors, Barry Littlechild (Group 9.5, Barry Attwood of Independent 8, and the BFCC were just some who so suffered). When 'Projections' (Silver Screen arisen from the ashes) was launched by Barry (the bane of the BFCC! ), many of us still subscribed to it in the vain hope it would fill the void left by ACE (there is a real need for these small independent magazines, kept going by enthusiastic knowledgeable contributors). That hope has been partially dashed for some of us because of the opinionated criticisms of contributor ‘Rex Osborne’. BUT WAIT: Shock! Horror! Rex Osborne doesn’t exist – he is but a pseudonym. ‘Inspector Wilton of the Yard’ (back yard) reveals the real culprit within. MAY BFCC: Whatever the reason for the mix-up in dates (and ultimately, as organizer I must assume the responsibility for that) we were reasonably satisfied by the attendance at the May BFCC, though the numbers were down a bit as one would expect. This was more than made up for by a super appreciative audience (with the certain exception of one malcontent) and the attendance of two keen collectors from the USA, of whom the change of date presented considerable logistical and monetary problems. I have included some of their comments towards the end of this news article to counter-balance negative comments made in 'Projections' about the past two BFCC’s by the aforementioned ‘Rex Osborne’. Editor Barry Littlechild dismissed Phil Sheard’s (Classic Home Cinema) complaint that readers are scared off by such sarcasm in print, simply regarding it as just banter and leg-pulling. Leg pulling is one thing, bloody-minded arrogance is not. However, to make our point we resort to a bit of ‘leg-pulling’ ourselves, and reveal why I, and some other subscribers to 'Projections' are not happy with certain aspects of the magazine. Stay with us, it’s quite entertaining and illuminating really! Over-bloated blockbusters seemed to be all the rage again this past summer and Hollywood continues to re-make past successes. One such production yet to come to fruition is the re-make of ‘Master of the World’ now starring Barry Littlechild as Rex Osborne, (playing, what else but the old Vincent Price’s role). Not so ridiculous as it might seem since Barry Littlechild and Rex Osborne are one and the same person! How do I know? Many years ago when Barry and his son Grant published Film Mart, an article by Rex Osborne appeared which flatteringly referred to myself as the ‘King of 8mm’ (how times have changed!). When questioned by me Barry readily confessed he was Rex Osborne – the nom-de-plume he used to disguise he was the writer of a number of articles. It might have worked then, but doesn’t now as the two styles of writing are identical. But read on, read on, don’t fall asleep yet! “Couldn’t believe the size of the screen, the 8mm image looked crap! From the projection area it was just about ok, that was before they tried to put on an Anamorphic lens, did it ever come back in focus? The poor buggers down the front must have been covered in film grain. Thank god that bloody band has gone, it used to be the quickest way to get rid of an audience!”. The jibe about the picture quality has been repudiated by many since then – among those to contest this slander was Bob Wood of Gloucester who said that he and his colleague Neil Daft sat in the cinema on that occasion and that the picture was always satisfactory - when a change of rack or focus occurred due to different items being spliced together, this is immediately rectified by the team of projectionists. Occasionally a poor print is screened about which little can be done – this is surely not unique to the BFCC? (although I admit our big screen could extenuate the shortcomings, but nevertheless the shortcomings are not of our making). Incidentally none of the BFCC team has ever seen Barry at the back of the hall or near the projection equipment, an area in which he would most definitely not be welcome! Incidentally, if you can see the grain clearly surely it must be in focus? In the 25 years or so I’ve been writing about our hobby for magazines such as Movie Maker, Super 8 Film Review, Film For The Collector, The Reel Image etc, I have never once, despite any private opinions I might have, criticised another event in print. It is not for me to tell Derann or Geoff Wheeler how to run their convention or business – that would be the height of extreme arrogance. Speaking of arrogance, what’s the content of the BFCC programme to do with Barry? If the events Barry uncritically supports had our numbers at their screenings they would be crowing much louder than us I am sure! ‘Popped into Wilton’s (BFCC) convention a few weeks back (don’t worry if you missed it, he will have about 20 pages in Film for the Collector telling us how wonderful it all was), saw a bit of Gladiator on the vast Imax screen, it didn’t look too bad from the back of the hall … why does he play all the 8mm via a DVD digital sound system? Surely If I want to be a print I want to hear as well as what I am getting from an un-doctored print! I don’t expect to run 200ft coupled to a DVD player and a THX sound system in my front room … by all means have it as a special show late in the evening but not during the new releases presentation!’. (end of quote .. oh, dear!, and by the way, once again no one saw him near the back of the hall!). If you were one of the ‘creeps’ present (nice way to describe fellow collectors) you might be wondering why indeed we don’t use video projection? Perhaps it’s because we haven’t such a paucity of ideas or shortage of film material at the BFCC that we have to resort to DVD. Video projection has been discussed many times here in Ealing’s secret bunker, and it will be used when appropriate (i.e. part of a talk to illustrate a system or an item not available on film, and maybe sooner than later). In any event I see no virtue in replacing film programmes for similar items on DVD - pathetic – this shows a complete lack of imagination. As for the occasional sync-pulse show these are enjoyed by a great many collectors as part of the BFCC film experience (see comments below). We did do a slightly longer one than normal in May but this was mainly for the benefit of our American visitors who had come along way and I aimed to give them good value for money. If Barry doesn’t like the programmes I compile, he surely does not have to attend. Alternatively he is free to organize an event of his own and show video to his hearts content. Better still he might be better advised, instead of sniping at the BFCC (and others don’t forget) to spend more time learning how to compile an interesting little magazine, devoid of criticism and sarcasm, just like his US counterpart, Steve Osborne, editor and publisher of ‘The Reel Image’. He might also refrain from dropping little asides about himself into his contributors copy and thus giving the impression they wrote them. Are you beginning to get the picture? The only way to improve, in my opinion, whatever project you apply yourself to, is by self criticism, and not by continually finding fault in others, usually a subterfuge for disguising your own failings. Barry Rexchild’s gibe about 20 pages about the BFCC is rich coming from the pen of a sycophant writing about rival conventions in glowing terms (never a word of criticism of these events of course). And while Barry is quick to criticise, he was very angry when ‘Projections’ itself was criticised on the 8mm forum; Here is his (edited) response; ‘Our ‘friends’ seem to really have it in for us … maybe we are ‘crap’ but we are keen and enthusiastic with ideas to share … so ‘up’ them! (nice turn of phrase, you must admit). It also implies that no else carries out a similar task or is helpful: arrogant nonsense! Barry/Rex picks on two sync-pulse shows compiled of four items. Many collectors really look forward to these shows (even if he doesn’t) as witnessed by the audience size and resulting applause. The BFCC showcases more films and more programmes than any similar event. We cater for all tastes throughout the day – not for a minority of one. Out of 8 shows containing in total some 50 items, including two 16mm shows, we are criticised for four sync-pulse items. This criticism might put of some collectors from attending, perhaps that is it’s purpose, who knows? BFCC technical –co-organizer John Clancy dislikes Barry intensely (I understand the feeling is mutual) and wanted him, after numerous bitchy reports, culminating in the above remarks, banned from the BFCC. I said no (John says I’m too kind!) – Barry is an old colleague who despite his Jeckle and Hyde personality has written good things about my videos and we’ve done each favours from time to time over the years, and, so he can, if he wishes continue to come to the BFCC (though it might be safer if he stays clear of the cinema!) ….. however, Rex Osborne is BANNED for life! Here are a collection (some edited for space) of unsolicited items taken from the criticised http://8mmforum.film-tech.com: The first is from one of the two Americans who attended. Paul Adsett: Orlando, Florida, USA: What a great country, fabulous scenery, warm friendly people, and great weather! Naturally I scheduled our UK vacation to include the BFCC, and I was not disappointed. I thought the venue of the Ealing Town Hall was perfect, permitting large screen presentation in the big hall. It was great to finally meet Keith Wilton and John Clancy (two really nice people) both of whom made us feel right at home. In a way it was like meeting old friends, because of Keith's Armchair Odeons videos I immediately recognized many people, such as Barry Littlechild, John Bird, and Colin Clark ("The Colinseum"!). The film presentations were excellent. I was amazed to see the tiny S8 projected onto a 24 ft Cinemascope screen and looking really good! The Pulse synch-to-DVD THX presentations can only be described as awesome. The THX sound thru John Clancy's audio system was as good or better than any theatre sound I have heard, with terrific stereo channel separation and surround (How they achieved this in a temporary set up is beyond me). Combined with beautiful sharp prints from Derann's latest Scope releases, and Classic's Spider-Man feature, it was just about impossible to believe you were watching super 8. Anyway thanks to Keith and John for putting on a really great show which had to be seen to be believed, and for making my wife and I feel most welcome. To any US collectors thinking of going to the October BFCC, I would urge you not to hesitate. You are in for a reel treat! To the UK collectors who don't go ,and complain about the long drive to Ealing, I say if Doug and I can make it from the States, you should have no complaints! (Hear, hear! - ed.). Chris Quinn: Bedfordshire Posted May 22, 2004: Just want to say a big thanks to all the organisers of the BFCC, with a special thanks to John and Keith, they put on a brilliant show. I was most impressed with the 2nd release of Gladiator and the extract from Spiderman and 5th Element. Barry Attwood Independent 8: Enfield, U.K. Posted May 23, 2004: I too was most impressed with the long "Spider-Man" extract, pulse synched with 5.1 DVD sound, it was a marvel, and the print has to be one of the best German releases I have seen. I enjoyed all the pulse sync demonstration, and found all the extracts (Gladiator & The 5th Element) to be of very high quality, and how Keith can get them into sync (especially "The 5th Element" extract) with the DVD is still a marvel too me. I saw most of the film shows, picked up one or two things for myself, and finished up across the road at the UGC Ealing watching "Van Helsing" for the second time, what better way for rounding a day out watching films, than by watching another (Barry later said that he sat near the front and the picture was fine). Mike Peckham: Worthing West. Posted May 23, 2004: I had a great day. Keith and John put a lot of effort in to them and it payed off, I am always amazed to see that tiny 8mm frame blown up and stretched on to such a big screen, the resulting picture quality really is testament to the potential of our favourite gauge! The sync pulse shows, despite a certain amount of nervousness and trepidation on the part of the organizers ran perfectly, the sound was brilliant. Just looking forward to the Autumn show now, have to start saving. Douglas Meltzer: New York: It is a beautiful sunny day for the 47th British Film Collectors Convention. I take the tube to Ealing, and a short walk later I am facing the lovely exterior of the 130 year old Ealing Town Hall. The presentations take place in the Victoria Hall, which has high vaulted arches and beautiful stained glass windows that are covered to darken the large space. The 24 foot ‘Scope screen (almost as big as the one in my apartment) is already in place on the stage. The Elmo GS-1200 Xenon is placed at the incredible distance of 75 feet from the screen! What a huge throw for such a small format. An audio test of the THX system rocks the hall. Booming! A Super 8 Blackhawk print of the 1934 Laurel & Hardy short “Oliver the Eighth” kicks off the presentation, followed by a 16mm instructional film showing the correct method of threading your Bell & Howell projector. Keith Wilton makes the point that you would have to already mastered the art of threading in order to watch the film that teaches you how to thread. Now comes the first block of new Super 8mm releases. From Classic is the funny 1932 Warners cartoon “Buddy’s Theatre”, with gags that all cine fans can relate to. Derann trailers for “Something’s Got to Give”,“Lost In Translation”, and the last Matrix were next and these looked fine on the big screen, especially the Matrix. A new computer animated short from Sony Pictures Imageworks titled "Early Bloomer" charmed the audience and had quite a few people heading out at intermission to buy a print at the Derann table. Clips from Classic’s “Rear Window” and “Rio Bravo” are next if a little dark. “Rear Window” has a very clear soundtrack, nice to hear on a super 8mm release, especially for such a dialogue intensive film (very few explosions, car chases and gunshots!). There were plenty of gunshots in Derann’s new extract, the complete gunfight sequence from the John Sturges 1957 western "Gunfight At The O.K. Coral". The print quality is good and I keep thinking that these prints will look even better in those collector’s homes that aren’t as big as the Victoria Hall! I sit with Paul Adsett and his charming wife Betty to watch the latest ‘Scope releases: Derann’s latest trailers are unveiled: “The Last Samurai”, “Return of the King”, and a double trailer reel, “Cat in the Hat & Elf”. The segment from Classic’s “First Blood” where Rambo escapes from jail looks good on the big screen, as does the scene from “Titanic”. The bluish hues of this night-time scene are very vivid. Now come the THX-sync pulse segments. The second Gladiator extract (the opening battle for Germania) looks great and sounds even better. The DVD audio synchronizes beautifully and makes the screening a true theatrical experience. People have said that this print is not in the same league as the first extract but this one really looked super. I’m not a fan of “The Fifth Element”, but the colours are wonderful in the print that was shown. “Battle of Carthage”, the first “Gladiator” extract released, is shown and I feel that in content this one works better as a complete sequence than the other extract.. Again, perfect audio. I’m curious to hear the difference (using the same sound system) between DVD sync pulse and an actual recording of DVD audio onto the film’s main & balance stripes. The screen is masked for the flat print of “Spiderman”. This is simply a great print. If this is an indication of the quality of the newer imports then I would not hesitate to buy future releases. Keith Wilton kindly invites me to join a small group at his place for dinner. It is a wonderful evening, with a look at the Sprocket Hole (his home cinema), and as I venture into the basement of memorabilia, I recall seeing this very spot in that classic tape, Armchair Odeons: Reel Three. Stories abound at dinner. Sitting diagonally across from me is Ken Locke, an editor and lecturer at past BFCCs. I have to shake Ken’s hand when he lets on that he’s responsible for the 600’ version of “Raise The Titanic”. Anyone who can turn that film into a compelling short deserves congratulations. Our thanks to fellow collectors and ‘creeps’ for those few words of comfort. For details of the next BFCC to be held on 23rd October 2004 please visit the Next Event page.